Girls in Years 7, 8 and 9 have three PE lessons each week, giving scope to deliver a variety of sports. Hockey, netball and swimming are the three sports concentrated on during the winter months. Girls are taught swimming by a top club level coach as well as our Head of Physical Education to assist the development of all levels. The students learn stroke technique, and receive vital preparation for the many galas through the year. Girls also play badminton and begin trampolining in Year 9. Improving technique and tactics in sports including athletic events, tennis and rounders is the focus in the summer months. Students in Years 10 and 11 have three lessons a week and are encouraged to select a variety of physical activities from a series of options. Netball and hockey are pursued by the majority of girls to ensure that their skill level continually improves, important for matches against other schools and the biennial sports tour. Alongside these sports, girls also enjoy badminton, aerobics, fitness, swimming and trampolining. Some pupils select activities which they may choose to continue when they leave school such as aerobics and using the gym. 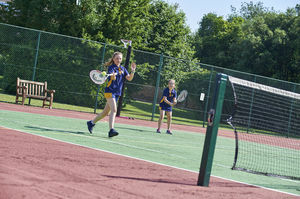 In the Summer Term, tennis, athletics and rounders are played. Throughout the GCSE PE course, students will have the opportunity to study a variety of sports as a performer. The theoretical aspects of the course are varied and engaging. Students will develop an understanding of the physiological, psychological and social aspects of sport, all of which enhance their overall confidence in PE. The practical section of the course contributes 40% towards the final grade with the theoretical element accounting for the remaining 60%. The A Level Physical Education (PE) course allows students to study PE in an academic setting, building on their previous knowledge gained through GCSE PE. The course will enable them to critically analyse and evaluate their physical performance and apply their experience of practical activity in developing their knowledge and understanding of the subject. The examined components will provide the knowledge and understanding which reinforces the practical examination section of the course. The practical assessment allows students to explore an activity in detail as a performer or coach, chosen from a wide variety of sporting activities. Students will also analyse and evaluate performance in a chosen activity as part of their practical section. Students will also have many opportunities to further develop their skills in Physical Education through a wide range of clubs as well as timetabled lessons in a variety of activities. Girls are encouraged to take positions of responsibility to develop leadership and confidence. Inter-House competitions are keenly contested in the majority of sports for all girls. Matches in the majority of sports are also played against other schools. Competitive sports is deemed extremely important. Students compete in a variety of sports and those who excel are encouraged to play at club level and trial at county level where possible. Extra-curricular sport is an essential part of the Physical Education Department, with an extremely high 75% of the student body taking part in at least one sports club out of school hours.